Jaici Sullivan is a music educator from Scottsdale, Arizona. She attended Northern Arizona University from 2011-2017 where she studied Music Education and performed in the NAU Symphony Orchestra, the NAU Wind Symphony, and the Flagstaff Symphony Orchestra. After graduating from NAU, she taught General Music at Constitution Elementary School in the Deer Valley Unified School District. She currently performs in the Celebrare Woodwind Quintet, the Phoenix Brass Collective and teaches private lessons at the North Scottsdale Music & Arts Lessons Studio. 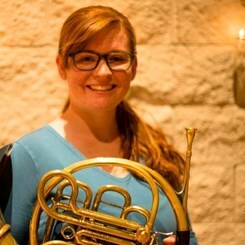 This year Jaici will begin studying Horn Performance at Arizona State University with Dr. John Ericson for her Master’s degree. Jaici has taught private lesson students of every age and experience level in horn, and has taught many beginners through intermediate playing levels on trumpet. She has helped students learn to play both instruments from the very beginning basics of musicianship, to intermediate audition etudes, and on horn for high school regional and all-state auditions, all the way through college audition preparation. Jaici teaches through finding music students are interested in learning and helping them discover a drive and sincere passion for performing by teaching musical concepts through music they are working on. Request Lessons with Jaici Sullivan today!